Personalized learning is more than a concept; it’s an entire movement. According to a survey published by the magazine Edweek, 97% of school districts have invested resources into personalized learning initiatives. In spite of its popularity, there is no single definition or implementation of personalized learning. However, most people can agree that personalized learning is grounded in the idea that each student learns differently: at different paces, through different methods, and with different strengths and weaknesses. With these differences in mind, the standard style of teaching--one teacher at the front of the classroom teaching the same material at the same pace to a group of students-- simply doesn’t make sense. Schools should use personalized learning models to adapt to students’ individual needs and interests by being flexible in the pace, content, and method of lesson plans. Implementation of personalized learning actually isn’t new; for decades, schools have implemented both gifted-learning programs for students that need to be challenged and intensive programs for students that need more support. Due to the rise of technology in education, new resources enable school leaders to understand their students as individual learners, and an increasing number of organizations have developed personalized learning models for schools to implement. These technologies range from complex statistical analysis that creates an entire curriculum for each individual student, to assessment-based technology that adjusts the difficulty of questions in real-time based on a student’s success in answering the questions. Personalized learning initiatives may be used within the standard curriculum and/or they may be used to adjust the standard curriculum itself. Initiatives that make no adjustment to the base curriculum will generally be focused on adjusting pace and difficulty to ensure that all students master the material. Initiatives that add to the base curriculum will generally be focused on finding ways to make the curriculum more interesting to students, with the idea that engaging students will increase understanding of the material as well as the students’ own investment into the learning process. To be able to listen to student needs and adjust expectations based on those needs, teachers and principals need to value flexibility and develop trust in their students. However, this flexibility still needs to be centered around a main learning goal to ensure a sense of direction for the program. The key components of a curriculum should be the center focus; personalization should only alter the methods used to teach students that curriculum. Giving students agency in their own learning requires them to clearly understand the central focus and learning goals, which is both a potential benefit and a potential limitation of personalized learning. Within this framework, the teacher’s role is to create opportunities for students to lead their own learning and to give the guidance needed to make sure they do so successfully. Other experts adhere to a more traditional teacher-led approach or suggest a blend of the two approaches. 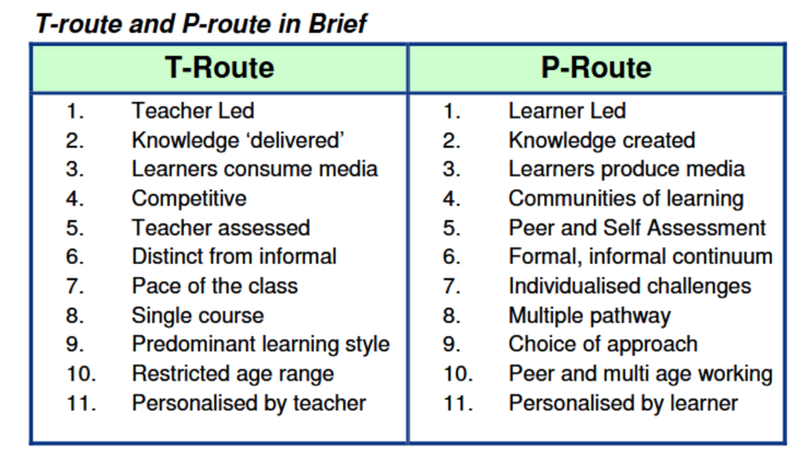 Dan Buckley, an internationally recognized expert in personalized learning, draws a distinction between personalization done by the teacher for the learner, called the T-Route, and personalization done by the learner for themselves, called the P-Route. Both methods have their advantages and challenges. The T-Route requires that teachers understand the needs of each individual student very well. At the same time, teachers have the best understanding of the learning goals and the pacing required to achieve those goals. When students personalize their learning themselves, it affords them more agency in the learning process. Students know best what will impassion them and how they prefer to interact with the material. On the other hand, they may not fully understand the scope of what they need to learn, instead focusing too narrowly on what interests them and ignoring what doesn’t. Moreover, students may not yet know the ways that they learn best, or they may not have developed the time management and self-discipline skills required to finish the material in a timely fashion. The Graide Network finds balance between student agency and teacher guidance. Usually, The Graide Network receives assignments given to an entire class in the same format, more in line with traditional methods of teaching and assessment. However, the feedback that the students receive from Graiders is specific to their own work. If the teacher gives no specific instructions about crucial feedback points, feedback will focus on areas where the most growth could be achieved for that student. Graiders are also encouraged to use specific quotes from the student work to illustrate points about strengths and areas for growth. This feedback allows students to engage with their own work in a way that traditional learning doesn’t. Teachers in a traditional setting often don’t have the time or resources to explain to each student individually what they could do better on every assignment. Graiders assist the teacher on this front, which gives the students accountability and the knowledge required to improve their own work. Moreover, it frees up teachers so that they may spend more time adjusting lesson plans and further personalizing the curriculum. The Graide Network also gives teachers the tools to implement the T-Route by providing a class summary of strengths and areas for growth as well as summary statistics of student achievement for each rubric component. When introducing personalized learning initiatives, it is important to understand the research touting the success or condemning the failure of personalized learning. Because of the lack of agreement on the definition of personalized learning as well as the diversity in implementation, the results of any study will be entirely dependent on the specific initiative that is implemented. Many articles claim that there is no evidence (or even evidence of failure) of these initiatives without actually describing which initiative is being discussed. Without understanding the initiative itself, it’s impossible to conclude that it was not successful. Despite the controversy and vague claims surrounding personalized learning, there are a few specific studies that indicate that personalized learning initiatives can be successful. LEAP Innovations found that their Pilot Network program, which helped connect qualified schools with personalized learning literacy technology, increased test scores in their 2014-2015 cohort by a level that “is equivalent to closing the achievement growth gap on NWEA for low-income students by approximately 45 percent, nearly closing the gap for Black students, and more than closing the gap for Hispanic students.” In the second year of the program (with different schools), “a typical student using a reading product in the Pilot Network would gain 13 additional percentile points above a typical comparison student starting with the same score (i.e., 50th percentile to the 63rd percentile).” Not only is this evidence in support of personalized learning, but it also indicates that technology can be a useful tool to educators. Another example of technology aiding personalized learning initiatives can be found in New York middle schools. Much of the personalized learning literature discusses “curriculum playlists,” or assignment charts that determine what each student will learn every day. An article published in Education Week gives the example of Joel Rose, who now runs a nonprofit organization called New Classrooms. When Rose was working for the New York Department of Education, he created these playlists manually for 70 New York middle school students. That process took 11 hours every day. Now, New Classrooms has a software that performs that process instead. That being said, other districts might not have the resources to implement such an initiative, or they may determine that it simply isn’t what their students need; it’s a fallacy to say that personalized learning requires such technology. In fact, much of the criticism surrounding the personalized learning movement is about the overuse of technology. Some teachers feel like these initiatives go too far, and sometimes the software replaces the role of the teacher. Kentucky Teacher Tiffany Dunn argues that the technology industry "doesn't understand that what kids need is someone to love them and get excited about them” and worries about simply "sticking a child in front of a computer for hours on end." This isn’t to say that all technology should be nixed, but just that school leaders need to consider the needs of their students when determining implementation. LEAP Innovations provides several strategies to personalize learning that don’t require technology. To create a learner-led atmosphere, they suggest opening up two separate classrooms to students, one that is quiet and suited to learners who prefer solitude, while the other is for active collaboration and conversation. Another strategy is for teachers to give a brief assessment at the beginning of a class, and then to create “dynamic groups for mini-lessons or independent work that learners can opt into based on their needs.” Indeed, most personalization initiatives do not require technology, but technology is often useful in both collecting the small data used to help individual students and helping teachers easily individualize curricula without having to write an education playlist for each child. Technology or no technology, school leaders need to understand that implementations of personalized learning must account for the different ways students learn. Introducing initiatives that force all students to learn through software in the name of personalization isn’t actually personalized learning, but rather blended learning. Personalization requires actual feedback from students about themselves and how they feel about the initiatives being presented. Teachers can collect their own small data to understand the ways in which they may personalize the curriculum. This data may be simple student feedback like we saw in the previous example where Alexis James’ students told her that they weren’t connecting with the material. The data may also be collected through technology, like the qualitative feedback that The Graide Network provides to each student after grading an assignment. Such small data can be used both as a way to decide which initiatives to implement and as an initiative itself. James took her student feedback to decide that the curriculum needed a component about Black History; The Graide Network could be a personalized learning initiative on its own. Personalized learning doesn’t need to replace teachers with computers or come up with a curriculum playlist for each student in order to be successful. Personalized learning is really about finding ways for students and teachers to work together to engage and support the student while still achieving learning goals. Successful implementation requires flexibility, trust in the student, and balance between student agency and teacher guidance. With these factors, personalized learning can go a long way in closing the achievement gap and engaging students in their own learning.